Heavy snowfall across much of the Upper Peninsula this winter is making conditions fantastic for snowmobiling, but not so great for moose and deer, resulting in riders and wildlife winding up on the same trails. In portions of Marquette and Baraga counties where moose are concentrated –particularly along Trail Nos. 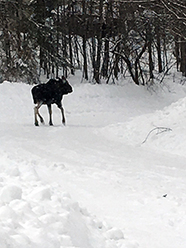 5 and 14 – snowmobilers are reminded to be on the lookout for moose on the trails. Moose: A moose walks along a road Saturday in the village of Champion in Marquette County.